While our heart is rooted in Kentucky bourbon, our taste can be a bit more continental: specifically, Portuguese. Portugal is the source of the port casks that give our whiskey its subtle and distinctive flavors. But we, as well as many other wines and spirits, owe Portugal a debt of gratitude for another surprisingly large contribution: cork. Roughly half of the world’s cork comes from Portugal, and it’s one of the more sustainable materials on the planet. The trees, a subspecies of oak, live up to 300 years, and cork can be harvested from each tree every nine years once it reaches the age of 25. Harvesting occurs between the months of May and August, when the cork can be removed from the trunk of the tree without permanently harming it. Cork forests provide a unique biodiversity to their regions, and many animals (and people) rely upon them for their survival. Cork has many other uses: building material, shoe soles—it’s even used as insulation throughout spacecraft and is able to shield crew from incredibly high temperatures. But even with all of these applications, 60% of all cork still goes into making bottle stoppers. 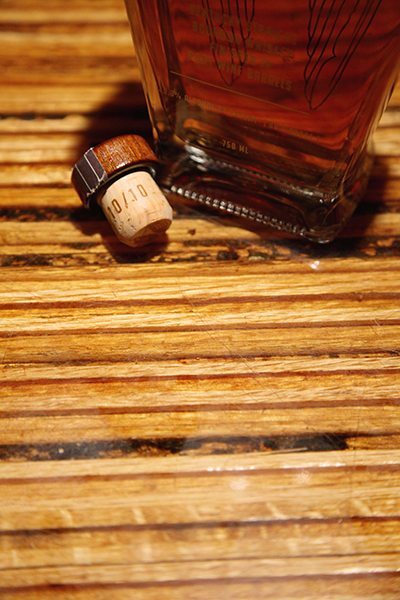 As a bottle stopper, cork’s impermeability and elasticity make it ideal as a reusable stopper. And it’s more eco-friendly than plastic or metal alternatives. We put a lot of thought into every aspect of our bottle, but for us, Portuguese cork was the obvious choice.